Sissy and Brother Bear, two orphaned bear cubs whose mother was mistakenly shot by a hunter on May 24, are thriving at the nonprofit Snowdon Wildlife Sanctuary in McCall. The sow was shot about six miles west of Challis. Spring bear hunting is open in hunting Unit 36 B from April 15 to June 30. However, Idaho Department of Fish and Game rules state that no female black bear may be taken if she has cubs in tow. According to a story in the Challis Messenger, Salt Lake City-area hunter Rhet Maxwell shot the sow on May 24 after he and his brother, Rob Maxwell, spotted it walking alone across an exposed slope. Rhet Maxwell said the cubs were high up in the branches of a nearby tree and out of sight. He contacted the department immediately upon discovering the cubs. Because they were too young to tranquilize, Maxwell scaled the tree and, after about an hour and half, managed to rescue the cubs and get them some food and water. Clemenhagen said in an interview that Maxwell told him he was “distraught” to discover that the sow he had shot had two offspring. Clemenhagen said that it was the first time in his experience since he began his job in early 2008 that a hunter had killed a mother bear not knowing that she had cubs. Brad Compton, assistant chief of wildlife for the Idaho Department of Fish and Game, said in an interview that across the state, a spring bear hunt is permitted because the black bear population is thriving. He said that in some areas, the spring hunt is conducted to reduce bear predation on elk. Also, he said, bear hunting at this time mitigates conflicts between humans and the bears, especially in the McCall area and in the Panhandle. Finally, he said, because the bear population is thriving, Fish and Game can respond to hunters’ requests to allow a spring bear season. Sanctuary board of Directors President Carolyn Walpole said the sanctuary currently has five orphaned bear cubs in captivity from this year’s season, including Sissy and Brother Bear. She said the other three, triplets, were orphaned due to a similar incident. However, she said, generally the cause of bear cubs’ mothers’ deaths is unknown. According to the Department of Fish and Game, some sows are killed by fires, some by collisions with cars and some by other bears. Hansen said Sissy and Brother Bear, who arrived at the sanctuary on May 26, are in a small enclosure where they are fed dog food, which packs on the calories. She said donated produce, such as strawberries, bananas and blackberries, is placed around the bears’ enclosure so they must forage for it as they do in the wild. In about two weeks, the bears will be transferred to a one- or two-acre enclosure. By then, they will practice their climbing on stump structures that the sanctuary provides to help prepare them to climb larger trees. Hansen said that by late fall or early winter, the bears will be released into the wild, at about the time when their instinct prompt them to search for winter dens. “We try to release them into areas where hunting season is over,” she said. Due to their calorie intake at the sanctuary, the bears will be plenty portly in preparation for the winter. By the following spring, Hansen said, they would be leaving their mother had they been left to their devices in the wild. 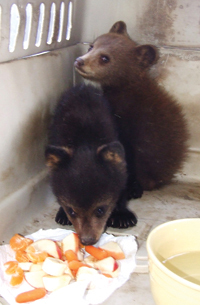 Despite their orphaned state, Brother Bear and his sister keep busy playing rough and tumble.